The bowflex body tower is very sturdy, works for pull-ups, chin-ups, dips and has straps for ab work. Nice wide base and adjustable. There are many choices available if you’re looking for a power tower to use at home as a supplement to your other workouts, or as your main piece of workout equipment. I think the Bowflex BodyTower is one choice worth taking a look at because of its versatility. The Body Tower allows you to do full-scale pull ups, chin ups, dips, push-ups and much more. In my experience, these are some of the most efficient exercises for building upper body strength. The Bowflex name has always been a well respected in the fitness industry, and their primary focus has always been home gym equipment. Their products are durable, flexible in their utility, and deliver what they promise. In this Bowflex Body Tower review, I’d like to share my feelings about some of the tower’s features and why I think the Bowflex Body Tower may be the right choice for you. Measures about 6’tall, a little over 4’wide and 4’ deep. The easy adjust horizontal bars moves smoothly up and down the height of the Body Tower. The quick motion is perfect for easily moving through your push ups, dips, leg raises, and a variety of other core and strength exercises. I think this multi-station tower is the most solid feeling piece of free-standing exercise equipment you will ever use to work out. Anyone looking for a pull-up station will enjoy this bad boy. The commercial-grade steel construction and wide base keeps the tower from moving around as you go through your routine. The included hand grips and sling straps allow you to perform exercises in ways that many other towers do not. The sling grips are perfect for doing inverted rows that hit every part of your back better than any straight bar I have ever seen. Mounted on the back section of the Body Tower is a placard that illustrates how to perform about 20 different exercises, each one unique and geared toward a variety of intensity levels. When fully assembled the Body Tower weighs 120 Lbs, is 77” tall, and 50” X 50” wide. Overall user weight capacity is 300 pounds. Most users stated that assembly is not very difficult and requires putting the top and bottom together and tightening a few bolts. A few users commented that after putting the two pieces together the tower is about 6’ tall and that made it hard to reach the bolts for tightening. The common solution was to lay the tower on its side, tighten everything down, and stand the tower back up. You are looking at basically 30 minutes to assemble it all said and done. 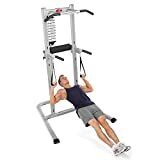 I did want to point out that there are extra sling straps included that allow you to do abdominal work like knee raises while hanging in the straps from your on your elbows. Great exercises for lower abs and obliques. There are also extra hand grips that you can attach to the bottom of the horizontal dip bars do use for push-ups or reverse pull-ups to focus on your lat muscles. I thought most of the customer reviews I read when researching the Bowflex Body Tower review were very positive. One guy was in the military and claimed to be a moderate workout warrior. He was a fan of Bowflex products which is why he chose the Bowflex Body Tower. His opinion rated the Body tower good to great. Another guy said he was very demanding on his exercise equipment. He had been looking at freestanding body towers to get away from his doorway pull up bar. He was looking for something that allowed him to do pull ups, chin ups, and dips, but also to use as an anchor for TRX. His opinion rated the Body Tower as a piece of equipment that delivers. After reading many of the reviews written by the users, the consensus seemed very favorable. Most users, even the ones who were somewhat skeptical at first, agreed that Bowflex has lived up to its reputation with the Body Tower and provided another great piece of functional exercise equipment. There were some minor complaints. A few of the taller guys felt like they needed more room when doing dips and thought the pull-up bar was too short. Some of the most aggressive guys that were into kipping got to rocking and rolling the tower a bit. So nothing came up that would have me saying, no I do not want this one. All in all, I’d say the aye’s overwhelmingly won the day. Compared to many of the other similar power towers this one provides a ton of value for the money. I hope this Bowflex Body Tower summary has provided some value for you. You can find more reviews and discounted pricing here.. If you have any questions about it please don’t hesitate to contact me. This is definitely one of my favorites by far. You can read about y second best choice here: the weider power tower.